In an important verdict, the Supreme Court, in Godrej & Boyce Manufacturing Company Limited vs Dy Commissioner of Income-Tax, held that Section 14A of the Income Tax Act would apply to dividend income on which tax is payable under Section 115-O of the Act. The Supreme Court, in Pawan Kumar Gupta vs BR Gupta, held that condonation of delay in payment of rents can take place only when defaulting tenant so pleads with justifiable reasons which would show that he was prevented from compliance by circumstances beyond his control. 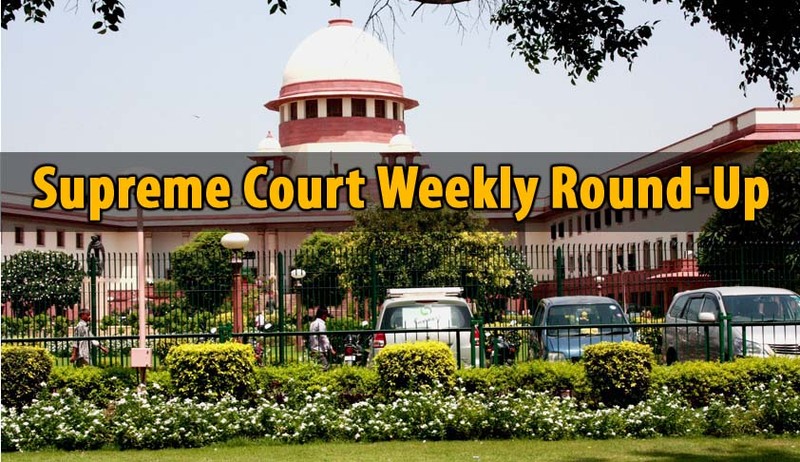 The Supreme Court, in Samir Vidyasagar Bhardwaj vs Nandita Samir Bhardwaj, upheld an interim order by a family court in Maharashtra, which directed a husband to remove himself from his own home and not to visit there until the divorce petition under challenge is finally decided. The Supreme Court, in State of Madhya Pradesh vs Kallo Bai, clarified that confiscatory proceedings are independent of the main criminal proceedings, and it is meant to provide a deterrent mechanism and to stop further misuse of the vehicle. In a huge setback to RJD chief and former Bihar Chief Minister Lalu Yadav and two others, the Supreme Court on Monday restored criminal conspiracy charges against him in a fodder scam case. The Supreme Court on Monday directed the National Disaster Management Authority to regularly publish its Annual Report, to review and update all plans, and to make its website multilingual, “so that all concerned may benefit”. Though the Supreme Court allowed appeals preferred by the Central Bureau of Investigation by restoring criminal conspiracy charges against Lalu Prasad and others in a fodder scam case, the bench, commenting on the delay caused in filing SLPs, said it is surprised at the conduct of the CBI in such important matters and how such delay could take place. A two Judge Bench of the Supreme Court on Tuesday held that industrialist Vijay Mallya is guilty of contempt for willful disobedience of Supreme Court’s order. The Bench has directed him to personally appear before the Court on July 10 to declare the sentence. In an unprecedented act, the Supreme Court on Tuesday sentenced Calcutta High Court judge C S Karnan to 6 months in jail for contempt. The Supreme Court on Tuesday closed the contempt proceedings initiated against Kerala Chief Secretary Nalini Netto for delay in reinstatement of expelled Kerala DGP T P Senkumar after accepting her “unconditional apology”. The Supreme Court declined to allow HIV-infected Patna-based woman to terminate her pregnancy, citing danger to her life. A bench led by Justice Dipak Misra relied on the report filed by a board of doctors from the All India Medical Science (AIIMS), which suggested danger to her life, if she was allowed to terminate her pregnancy at this stage. Supreme Court of India on Tuesday referred a new petition challenging the constitutional validity of Aadhaar (Targeted Delivery of Financial and Other Subsidies, Benefits and Services) Act to the Constitution Bench dealing with the Aadhar MATTERS. Taking cognizance on a letter issued by Law Ministry to Secretary General of Supreme Court, a three Judge Bench of Supreme Court of India issued notice in a suo motu PIL to state governments seeking their response on Central Selection Mechanism for Subordinate judiciary to make selections to the subordinate judiciary across the Country. The Supreme Court, while considering a plea by Dar-Us-Slam Educational Trust, issued certain important interim directions with regard to admissions in medical colleges across the country. Supreme Court of India on Friday agreed to hear an urgent plea to stay the Notifications issued under Section 7 of the impugned Act, by various Ministries, making possession of Aadhaar number as a mandatory pre-condition for availing 17 social benefits schemes like Midday meal, Disability pension etc. The petition will be heard by a two Judge Bench on May,17. Continuing to take keen interest in the issue, the Supreme Court ordered that a new executive officer should be appointed for the historic Shree Padmanabhaswamy temple by June 18 in consultation with the temple trust.